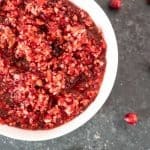 I know, I know….its a big claim to label this blog post “The Best Cranberry Sauce Recipe.” I get it. There are so many different variations to cranberry sauce that it’s hard to say what’s the best. I understand! I grew up a HUGE fan of the jellied cranberry sauce right out of the can. Mmmmm…I can practically taste it right now. My grandma would serve it up just for me, hardly anyone else in the family would touch the stuff. I also loved it on the turkey sandwiches I’d eat for leftovers for days after the big Thanksgiving meal. So if I loved jellied cranberry sauce so much, why would I go and mess with a good thing? My stepfather is a hobby chef and for years we would cook Thanksgiving together he and I. It was he who introduced me to a totally different cranberry sauce, one that’s more of a relish. This cranberry sauce rocked. our. world. It’s an amazing blend of flavors that are the totally polar opposite of what I grew up with. My husband and I were instant converts! The best part of this recipe is how easy it is, just watch the video below! You can prep it when you have a spare ten minutes during your Thanksgiving cooking and then let it sit, at least 30 minutes, and enjoy! It’s really a delicious tangy side and the easiest thing you’ll make all day! 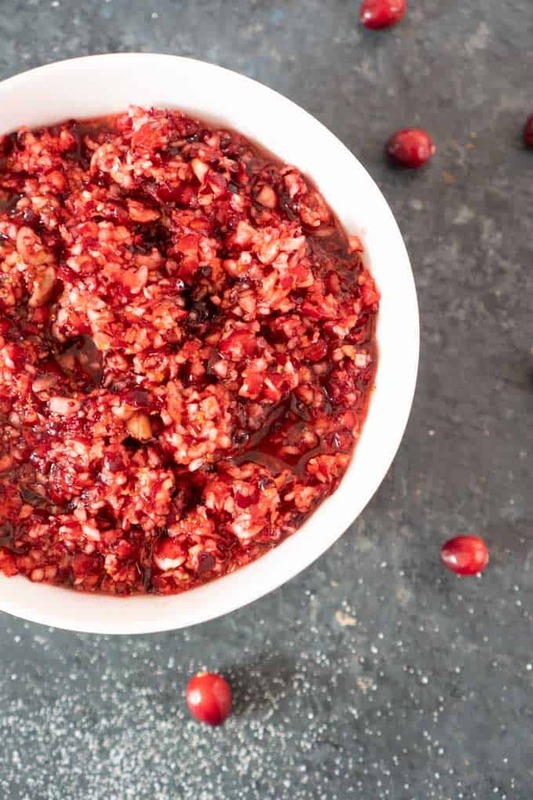 A grownup version of your favorite holiday side dish, this Cranberry Sauce is made with Grand Marnier liqueur and is sure to be a Thanksgiving favorite! Place all ingredients in a food processor. 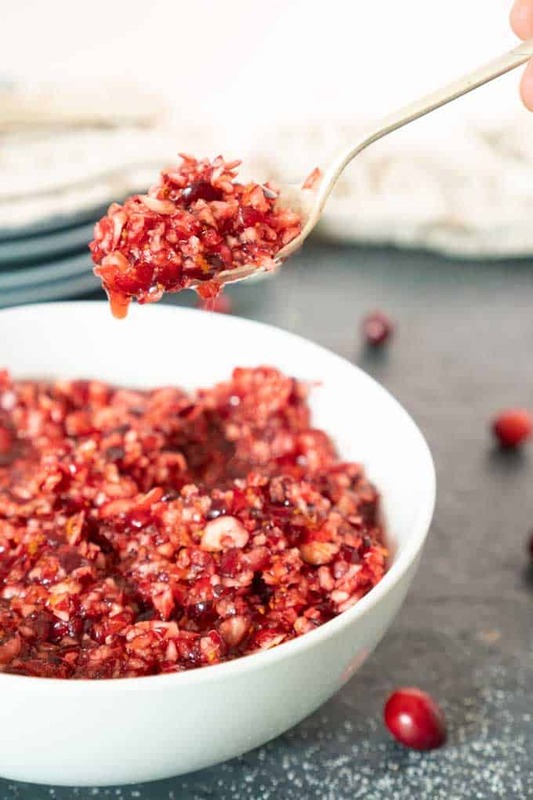 Pulse several times to breakdown the cranberries and incorporate the ingredients. It should still be a little chunky. 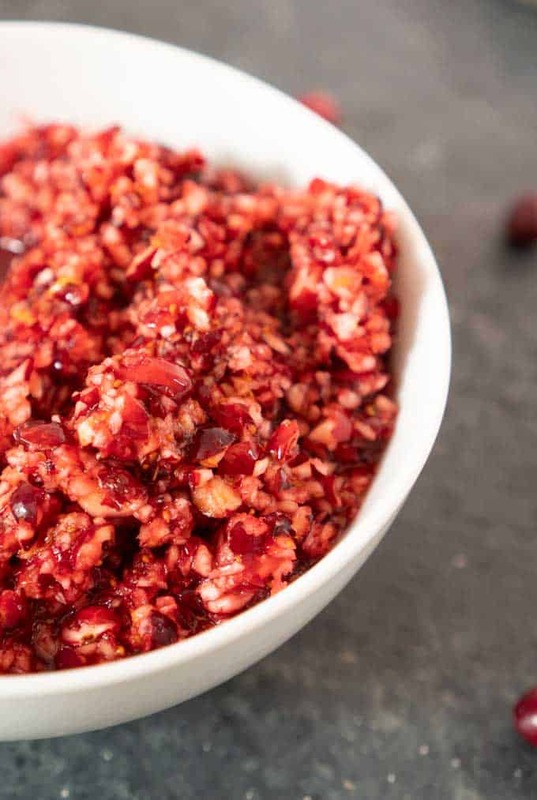 Allow the cranberry relish to sit at room temperature for at least 30 minutes before serving so the flavors can come together. Serve. After relish has been sitting for 10-15 minutes or so, taste it. If it needs to be a bit sweeter, add a little more sugar and continue to let it sit and come together. Check the consistency. If it needs more liquid, add a bit more orange juice.